Aging in the weather's elements will eventually take its toll; your exterior surfaces begin to fade and show signs of wear and tear. Because the declining state of your home's exterior is gradual, it may not be readily noticeable by you. If you look closely you will see the fading and wear and tear; It's possible you will feel a powdery residue on your hands when you rub some paint, or you will see some cracking of paint or of the caulking. In most cases you will know that it's time for repainting and exterior updating with a new fresh paint covering on your window trim, door trim, doors, eaves and siding. 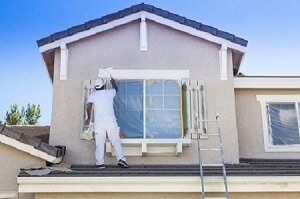 ​Yes, it's time to call Ontario's best exterior painting contractors. House Painters of Vaughan is your 'high quality finish' and the 'best in preparation residential painting company'. We make sure that we perform proper cleaning, priming, sealing, drip coverage along with tried and true safety procedures. After final coat painting we complete our appointment with a thorough clean-up and walk through inspection. ​House Painters Vaughan thoroughly cleans the areas to be painted. Cleansers and high power pressure washers get the dirty part of the job done first, and with eco-friendly solutions. Peeling and chalking is usually evident; it will be eliminated along with unwelcome surface materials and organic attachments in order to create surefire adhesion along with a ultra-clean appearance. Since we may be there, you might consider driveway, walkways and patios or decks that might require cleaning, staining or recovering. We do most types of surface finishing. Caulking is a flexible sealant used in cracks where whether driven expansion and contraction has taken place. Silicone caulking is not used as it not so paintable; in fact, it is usually removed prior to new paint applications if it was previously applied. We use latex caulking only.​ Putty filler, which was often used on older buildings for moisture and cold issues will be replaced if necessary. ou won't see us paint putty due to its own appeal, but it I can take weeks to fully dry. Concrete paint and sealers; graffiti and paint removal, garage floor cleaning and resealing, these are some of the extra services we provide along with guarantees to make you comfortable. Call us. ​Decks, fences, gazebos and sheds have a lifespan that will be defined by the amount of care and maintenance they receive. The structures are mostly built of soft woods (cedar, pine) and require fairly constant care. With the northern climes we are in, the winds, rain and snow are relentlessly bashing these valued structures causing the eventual loss of their protective coats. Inevitably they begin to show wear and tear, perhaps rotting. 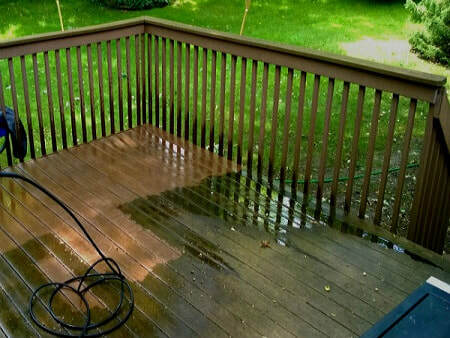 Eventually, the deck will get tired; fence repairs will become necessary, and re-staining will be in order. Outdoor enjoyment requires decks and fences and other structures to look nurtured and alive. ​​Nothing looks worse than sagging rotting wood products on a property. You might not notice the wear on your wood surfaces so much because you live with it day in, day out, but be certain that care needs to be taken if you want your assets to have an extended life. Decks, fences and gazebos cost thousands of dollars, so it makes no sense to avoid the care that they need. 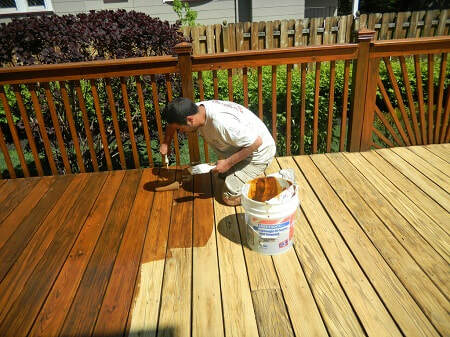 House Painters Vaughan has extended experience working with most wood and concrete products and structures including hard surface patios and flooring. So if your fence is hanging over the property line, give us a call. A diligent maintenance program will extend the life of your wood assets and keep your property looking beautiful; something to be proud of. Curb appeal is important, make sure the attachments look as good as the house.